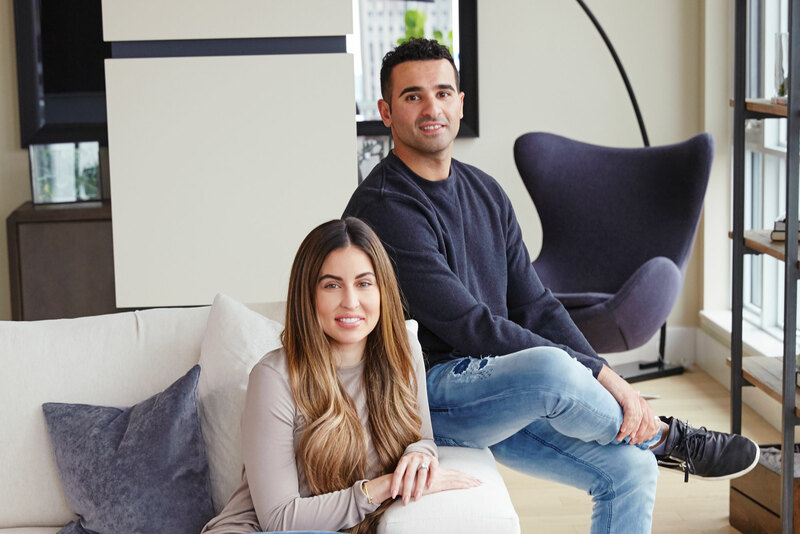 Married since July 2018, professional hockey player Nazem Kadri and his wife Ashley were excited to plan their first home together. To get the look they wanted, they partnered with Leon’s to create a home they both love. How did you two blend your decorating styles? Ashley: Even though I had my heart set on some pink chairs, I knew that wasn’t going to happen. Nazem: We worked together and there was a lot of compromising. I’m more conservative and Ashley takes a more creative approach. Did you have a specific look in mind when you were furnishing your place? Ashley: We like a lot of bronze, marble and plush fabrics in neutral tones. What did you like best about shopping for your home? Nazem: It was easy, the and Leon’s sales staff were so accommodating. Leon’s had a good selection of products and lots of great quality pieces that really worked well with the look we had in mind. They had exactly what we wanted. And, they even had special-order colours that allowed us to personalize our style. Nazem: My man cave, for sure. It’s my oasis. It has a great sound system, TV, and of course, a stick hockey table. The guest room is so airy. Why did you pick this look? Ashley: We’ve made our guest room warm and inviting. To make them feel really welcome, I like to create a snack tray for them with an assortment of cheese, crackers, nuts, fruit and chocolate. Try this look at home: Alexis Queen Upholstered Bed, Illusion Mirrored Night Tables, and Dallas Table Lamp. If you could pick one favourite product, what would it be, and why? Nazem: It would have to be the mattress. All our mattresses are from Leon’s, and the staff really took the time to find the right mattress for us. Quality sleep is very important to me to be able to perform my best on game day. What item can you not imagine having in your home? Ashley: I love my KitchenAid mixer so much that I went back to Leon’s and bought one for my mother-in-law.